Voting rights continues to be a highly contentious issue in America. Starting after the 2010 midterm elections, legislators in dozens of states introduced scores of laws to make it harder to vote. Voters and advocates pushed back at the ballot box and the courts. Some lawmakers started pushing laws that improve access to the ballot box. Below you will find a regularly-updated, comprehensive roundup of introduced, pending, active, and passed voting bills. 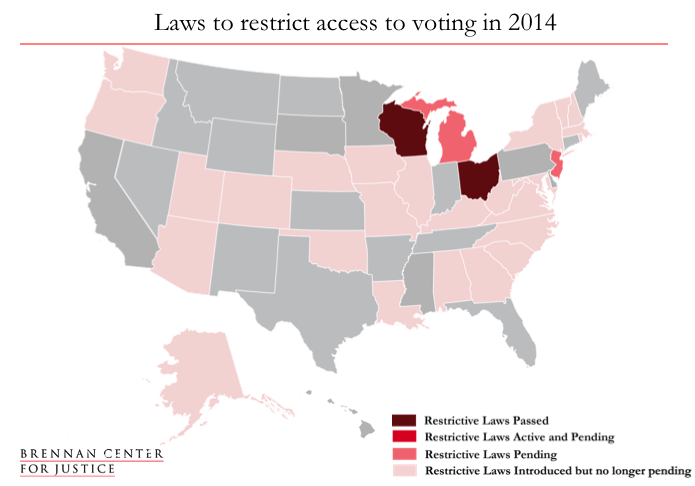 See our roundup of voting law changes since the 2010 election . Also see our roundup of voting law changes in 2012  and 2013 . 12 states plus the District of Columbia have passed 19 expansive bills  this session. Two states have passed 4 restrictive bills  this session. Note: In the cases where more than one piece of expansive legislation has been introduced in a state, the map reflects the state’s passed, active, or pending status based on the piece of legislation that has advanced farthest in the legislative process. A new influx of bills to enhance voter access is drawing support on both sides of the aisle, many bearing much similarity to the recommendations offered by the president’s bipartisan commission. Efforts to modernize our voter registration system are particularly prevalent. A.B. 1589 : Streamlines ballot requests for military voters. S.B. 1063 : Provides voter registration assistance to eligible applicants in juvenile detention facilities. S.B. 113 : Expands pre-registration to vote to 16-year-old citizens. S.B. 161 : Expands language access for voters who speak a language other than English. H.B. 452 : Prohibits distribution of false information about the time, date, place, or means of voting with the purpose of interfering with the franchise. H.B. 2590 : Establishes same-day registration at absentee polling places starting in 2016, and Election-Day registration at polling places starting in 2018. H.J.R.C.A. 52  / H.J.R. 102 : Places a ballot measure before voters to establish constitutional protections against discrimination in voting. Voters approved the measure in the November 2014 election. H.B. 105 : Establishes pilot program to expand early voting for 2014 general election; establishes pilot program for same-day registration for 2014 general election; expands opportunities for students to vote. H.B. 501 : Permits 16- and 17-year-old citizens to pre-register to vote when they apply for their driver’s license. H.B. 4072 : Establishes online registration; permits 16- and 17-year-old citizens to pre-register to vote; establishes early voting starting 11 business days before the election until the second business day before the election. H.F. 2096 : Establishes online registration. H.B. 624 : Expands access to absentee ballots for deployed emergency response providers. L.B. 661 : Establishes electronic registration at DMVs; establishes online registration. H.B. 2576 : Expands access to absentee ballots for voters living on tribal lands. S.B. 825 : Expands absentee voting options for military voters and their families. H.B. 156 : Establishes pilot program for Election Day registration. S.B. 117 : Allows registered voters without a DMV signature to update their registration information online. S.B. 135 : Gives voters more time to register through certain methods. B. 20-0264 : Establishes online registration. Modernizing voter registration . At least 29 states plus the District of Columbia have introduced bills that wo uld modernize their voter registration systems, in whole or in part, and make it easier for eligible citizens to register. Bills to modernize voter registration have passed in 6 states plus the District of Columbia: Hawaii, Illinois, Massachusetts, Minnesota, Nebraska, and Utah. Broad-based modernization . At least 3 states have introduced wide-ran ging legislation to modernize the voter registration process using some combination of electronic transfer of voter registration information, online registration, portability, and fail-safe protections. Electronic registratio n. At leas t 6 states h av e introduced bills that would allow for electronic transfer of voter registration information at state agencies. Online registration. At least 18 states plus the District of Columbia have introduced bills that would establish or enhance the use of online registration systems. Same-day registration . At least 19 states have introduced bill s that would allow voters to register on the same day they vote. Same-day registration (SDR) bills can vary in that some allow same-day registration on Election Day only (EDR), some allow it during an early voting period only, and some may allow both options. Portability. At least 6 states have introduced bills that would allow a voter’s registration to move with her when she moves to a new address within the same county or state. More registration opportunities. 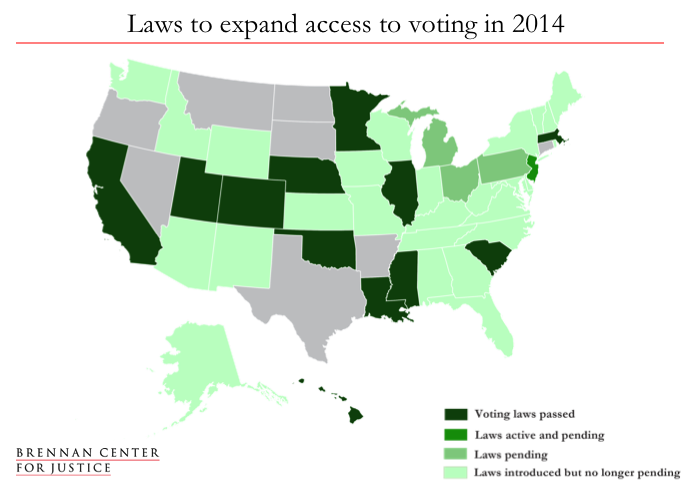 At least 9 states have introduced bills that would expand opportunities to register to vote. Pre-registering students to vote. At least 13 states have introduced bills that would allow students under the age of 18 to pre-register, so that upon turning 18 they are registered to vote. More early voting opportunities. At least 23 states have introduced bills that would newly introduce, or expand, opportunities for early in-person voting. Restoring voting rights. At least 12 states have introduced bills that would expand opportunities for those with criminal convictions to regain their right to vote. Identification laws. At least 11 states have introduced bills that would relax existing voter ID or proof of citizenship laws. Making it easier for students to vote. At least 2 states have introduced bills that would make it easier for students to register and vote. Reducing long lines. At least 3 states have introduced bills to reduce waiting times by requiring, or assessing, the implementation of minimum standards for efficient polling place administration. Improving disability access. At least 5 states have introduced bills that would make it easier for voters with disabilities to cast a ballot. Improving language access. At least 2 states have introduced bills that would expand language access for voters who speak a language other than English. Improving access for military voters. At least 7 states have introduced bills aimed at expanding opportunities to vote for voters in the military. Expanding access to absentee ballots. At least 15 states have introduced bills aimed at expanding opportunities to cast an absentee ballot. Guaranteeing the right to vote. At least 4 states have introduced bills that would amend their constitutions to guarantee the right to vote. State preclearance. At least 3 states have introduced bills that would require a preclearance procedure modeled after Section 5 of the Voting Rights Act. Improving list maintenance. At least 1 state has introduced a bill to improve voter list maintenance to protect eligible individuals against wrongful removal. Preventing deceptive practices. At least 3 states have introduced bills that would make it a crime to knowingly distribute false information about an election to mislead voters. Note: In the cases where more than one piece of restrictive legislation has been introduced in a state, the map reflects the state’s passed, active, or pending status based on the piece of legislation that has advanced farthest in the legislative process. S.B. 205 : Conditions any determination by the Secretary of State to mail unsolicited absentee ballot applications on legislative funding for that particular mailing. S.B. 216 : Prohibits individuals who lack identification or a Social Security number from voting even with a provisional ballot. S.B. 238 : Reduces early voting period and eliminates same day registration by eliminating the week during which voters could simultaneously register to vote and cast a ballot early and in person. S.B. 324 : Reduces early voting period and hours. Photo ID laws. At least 19 states have introduced bills either requiring voters to show photo ID at the polls or making existing photo ID laws more restrictive. Proof of citizenship laws. At least 4 states have introduced bills requiring proof of citizenship, such as a birth certificate, to register or vote. Making voter registration harder. At least 13 states have introduced bills to limit voter registration mobilization efforts and reduce other registration opportunities. Reducing early voting opportunities. At least 4 states have introduced bills to limit existing opportunities to vote early in person. Making it harder for students to vote. At least 2 states have introduced bills that would make it harder for students to register and vote. Reducing access to absentee ballots. At least 6 states have introduced bills that would reduce access to absentee ballots. Making voter purges worse. At least 2 states have introduced bills to limit protections for voter purges and increase the chance of wrongful removal of eligible voters. This document tracks certain voting legislation making it easier or harder to register or vote. Note that the numbers in this document do not tally several types of election- and voting-related legislation, including: ballot design, voting machines, enfranchisement of people under 18 or non-citizens, public or individual notice requirements, or expanding authority to conduct elections primarily by mail ballot. The document also does not track other administrative changes that could indirectly expand or restrict access, such as counting provisional ballots, or minor departures from the status quo that are unlikely to have a substantial impact. The numbers in this document also do not reflect changes to rules for challenging voter eligibility. Additionally, bills that carry over to the 2014 session from a prior session are included in the counts of “introduced” bills. For purposes of this document, a bill has passed if it has advanced through all required stages in the legislative and executive branches, including signature by a governor if necessary. Thus, in most cases a bill that has advanced through both houses of the legislature is not counted as passed unless a governor has signed it. Certain types of legislation, such as resolutions, can advance fully through the legislative process without signature by a governor; these are counted as passed if they have cleared the legislative branch. Legislation that places a ballot measure before voters is counted as passed, even if voters have not yet approved the measure, as long as the legislation has advanced through all necessary stages of the legislative and executive process. If a ballot measure has been rejected by voters, it is no longer counted as passed. Accordingly, the controversial  Missouri measure which would have allowed for six days of early voting, but would have set a constitutional limit on the legislature’s ability to provide additional early voting days is not counted as passed at this time because it was rejected by voters on November 4, 2014. Alabama, Alaska, Arizona, California, Delaware, Florida, Georgia, Hawaii, Idaho, Illinois, Iowa, Massachusetts, Michigan, Minnesota, Mississippi, Missouri, Nebraska, New Jersey, New Mexico, New York, North Carolina, Ohio, Pennsylvania, Rhode Island, Tennessee, Utah, Vermont, Washington, Washington D.C., Wisconsin. California, Florida, Georgia, Idaho, Missouri, New Jersey. Alabama, Florida, Georgia, Idaho, Iowa, Massachusetts, Michigan, Minnesota, Mississippi, New Jersey, New York, North Carolina, Ohio, Pennsylvania, Rhode Island, Tennessee, Utah, Washington D.C., Wisconsin. Alabama, Alaska, Arizona, Delaware, Georgia, Hawaii, Illinois, Massachusetts, Michigan, Mississippi, New Jersey, New Mexico, New York, North Carolina, Pennsylvania, Tennessee, Utah, Vermont, Washington. Georgia, Massachusetts, Mississippi, Nebraska, New Jersey, New York. California, Hawaii, Idaho, Michigan, New Jersey, New York, Utah, Washington, Wisconsin. Of these states, New Jersey and New York introduced bills to designate additional agencies as voter registration agencies under the National Voter Registration Act (NVRA). Additionally, Idaho, which is exempt from the NVRA’s “motor voter” requirement, introduced a bill to provide for voter registration at state DMV offices. Arizona, California, Iowa, Louisiana, Massachusetts, Michigan, Mississippi, Nebraska, New Jersey, New York, Ohio, Virginia, Washington. Arizona, California, Florida, Georgia, Illinois, Louisiana, Maine, Maryland, Massachusetts, Michigan, Minnesota, Mississippi, Missouri, New Jersey, New York, North Carolina, Ohio, Oklahoma, Pennsylvania, Rhode Island, South Carolina, Tennessee, Virginia. Arizona, Florida, Iowa, Kentucky, Louisiana, Minnesota, New Jersey, New York, Tennessee, Virginia, Wisconsin, Wyoming. Arizona, Kansas, New Hampshire, North Carolina, Ohio, Oklahoma, Pennsylvania, Rhode Island, South Carolina, Tennessee, Wisconsin. Minnesota, New Jersey, New York, Pennsylvania, South Carolina. California, Florida, Michigan, Missouri, New Jersey, New York, South Carolina. Indiana, Iowa, Maryland, Michigan, Mississippi, Missouri, New Jersey, New York, Ohio, Oklahoma, Pennsylvania, South Carolina, Tennessee, Virginia, West Virginia. While not counted here, legislation has been proposed in at least 8 states to expand authority to conduct elections primarily by mail ballots. Such bills have been introduced in Alaska, Arizona, California, Colorado, Iowa, Michigan, Nebraska, and Utah. Florida, Hawaii, Illinois, New York. Alaska, Colorado, Illinois, Iowa, Kentucky, Maryland, Massachusetts, Michigan, Missouri, Nebraska, New Hampshire, New Jersey, New York, North Carolina, Ohio, Oklahoma, Rhode Island, Washington, West Virginia. Massachusetts, Oklahoma, South Carolina, Utah. Alabama, Arizona, Colorado, Kentucky, Missouri, Nebraska, New Jersey, North Carolina, Ohio, Oklahoma, Oregon, Vermont, Wisconsin. Georgia, North Carolina, Ohio, Wisconsin. Arizona, Iowa, Kentucky, Ohio, South Carolina, Washington.